As I mentioned on my main-page post, I've recently signed on to freelance for a Pathfinder supplement on lycanthropes and am having a fantastic time with it. 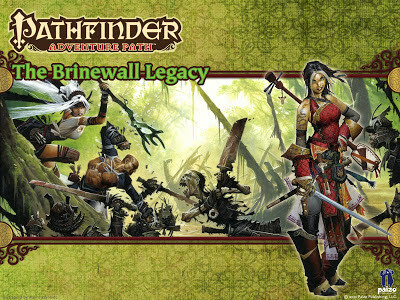 Going hand-in-hand with that, I and writer John Michael Perkins started a bi-monthly Pathfinder game several months ago. I'm excited to be back behind the DMs screen next week running one of my favorite of Paizo Publishing's award winning Adventure Paths--The Jade Regent. The best characters in literature go through change. They start a story in one emotional or mental state and end someplace very different. They may want something, or believe they want something, at the start of a story, then by the end want something very different. In writing, we call it character growth, or a character's arc. When you are developing a character for any roleplaying game, keep in mind what emotional state they are starting in and how they may change by the time the campaign or story is over. You don't have to know exactly what that change will be, but giving a character the opportunity to grow adds depth and freshness to Player Characters (PCs), particularly in long campaigns. The change may be purely roleplaying, like hating a particular race, culture or non-player character (NPC), then learning to trust them, or it may manifest itself as a game-related change, like adding levels in a new class. Or it could be both.